There may come a time when you have made some changes to the original texture and you want those changes reflected in-game, but don’t want to delete the old objects and replace them with the new texture. Thankfully, MightyEditor offers a way to update the texture, simply head to the ‘Assets’ panel, click on an asset and, in the ‘Settings’ panel, click on the blue ‘update’ option. 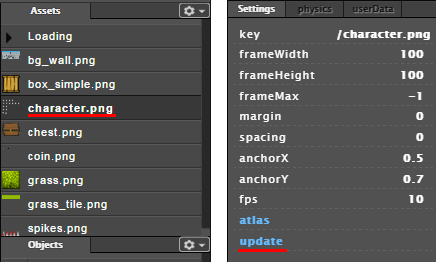 Then just browse to the updated file (or a completely different sprite). You will have to reset the frame size values, but everything else shall be preserved.